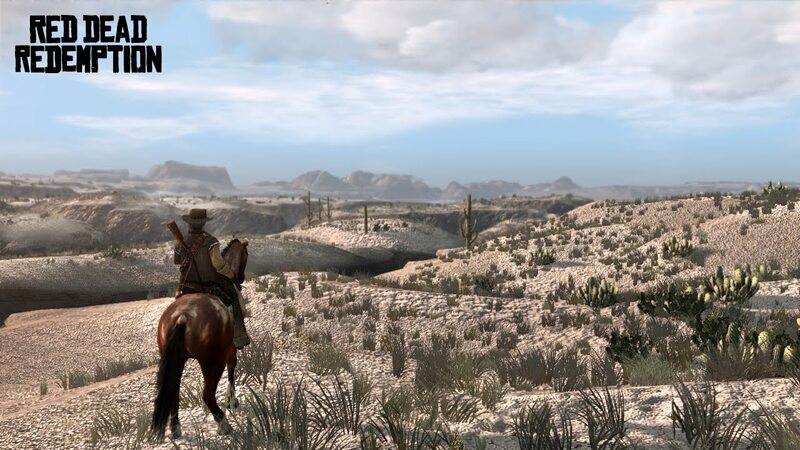 The world of Red Dead Redemption is often a slow one. Its mechanics and systems reflect many of the realities people faced before the advent of widespread electricity, access to automobiles, and commercial air travel. In a medium that often measures success and failure in terms of seconds, the experience of having to spend minutes just to travel from location to location is a unique novelty that also serves to convey the game’s story and illustrate the environment. However, RDR does not always make its players mosey, and there are certain game systems that seem to undercut its signature slowness. RDR finds itself torn between a philosophy of deliberately slow, methodical dynamics and the temptation to provide the player with instant gratification. The result is a unique synthesis of design choices that can test the player’s patience while also times indulging their desires for instant gratification. 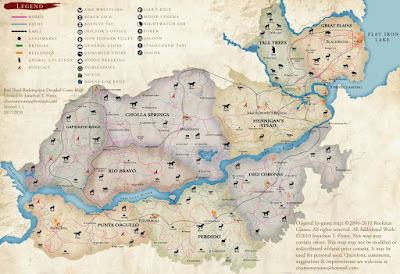 RDR’s character movement systems illustrate the game’s emphasis in slow play. 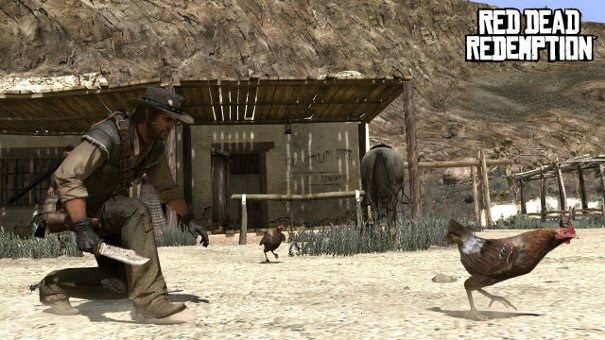 By default, tilting the control stick all the way in any direction causes John Marston to walk, whereas in most other games, a full tilt causes an avatar to run. To move any faster, the player must hold down the run button, and even then they have not reached top speed. This is only achieved when the player is actively tapping the run button while pointing Marston in the desired direction. 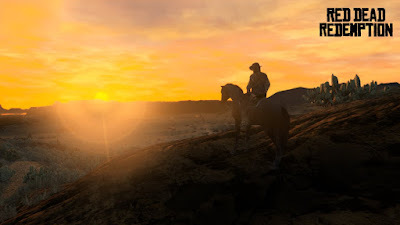 By requiring additional action and exertion on the player’s part, RDR mimics the dynamics of the real world: walking is slow, but requires little energy while sprinting is fast, but requires a lot of energy. While the game does not go so far as to implement a fatigue system, it is more physically demanding to constantly hold or tap a button when moving. These extra requirements suggest that that moving quickly is the exceptional way of traveling, and that the game world’s concept of “normal” speed is relatively slow. Horse travel is similarly addressed. Instead of handling like a car that happens to have four legs, RDR’s horses must be actively managed. While using a horse is much faster than travelling on foot, the player is subject to specific design choices that cap their speed. Like Marston, a horse’s default control stick movement is a slow walk. The player must virtually spur the horse into a trot with the run button, and continue spurring until the horse reaches the desired speed. Once this happens, the player must continue to put pressure on the horse by holding the run button, lest it begin to slow down. The horse’s endurance also effects the game’s overall speed, as pushing a horse too hard will only earn you a short trip through the air and onto the ground. 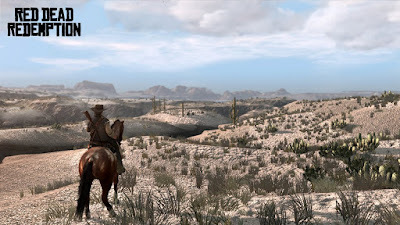 In most games, vehicles allow the player to drive as fast as possible without having to worry about damage or fuel, but the horses in RDR enforce a slower pace. Interacting with RDR’s flora and fauna also tends to be a measured experience. Subtle aspects of hunting and gathering plants reinforce the game’s insistence on gradual progress. Barring the occasional glitch, skinning killed animals involves watching an animation whose length varies depending on the size of the animal. In many games, killing a bear would yield a convenient item drop that could be added to your inventory by running over it. RDR forces players to examine the body, press a button to skin it, and then watch an animation before they can claim their prize. Similarly, flowers must be carefully gathered on foot and are only added to the inventory after a short communion with nature. However, while RDR has many features that approximate the slow pace of rural life, it also has design choices that reflect the sensibilities of modern video games. Using an item such as medicine or horse pills are accessed through a menu option that instantly applies the item’s effects without so much as a canned animation. In a game that repeats the same animation even after the thousandth wolf is skinned, it is strange that we never have to stop and slow down in order to let Marston take a drink. When the player sits down for a few rounds of poker, they have the option to skip directly to their turn without having to watch the other characters play their hands. In a game punctuated by long, philosophical conversations in even the most stressful situations, moments of leisure are oddly silent and efficiency-driven. Rather than being forced to shoot the breeze with your fellow dice players, you can continuously skip to your turn. It seems strange that one of few experiences you can rush through is a casual game of chance that is ostensibly meant to allow you to relax and take a break from life’s pressures. What happens when RDR’s penchant for leisurely pacing meets the pressure to indulge the player’s desire to rush? The answer lies in the strange hybrid of dynamics found in the fast travel and save systems. 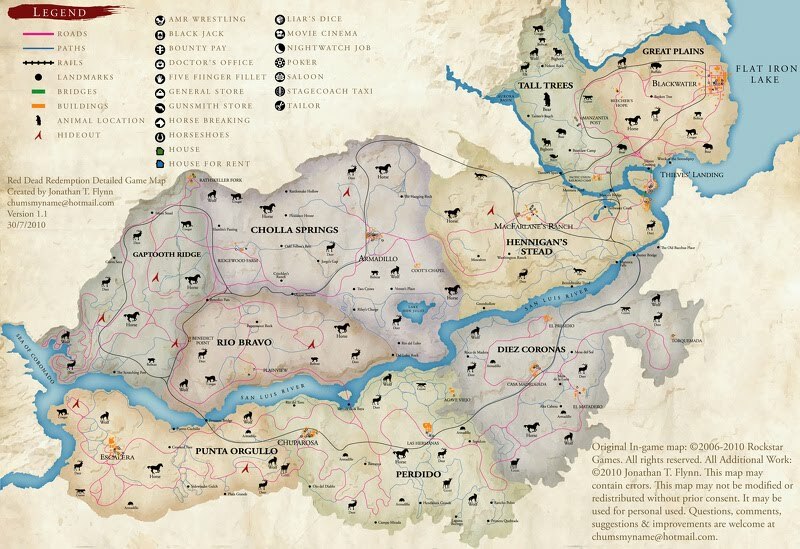 Like many open world games, RDR features a way to quickly move between points on the map by using narrative conceits that justify unusually fast travel. By using a camp site or a stage coach, the player can travel to a point of their choosing. While much faster than walking or riding, this method also involves some quirks that slow down the process. In order to fast travel to a certain waypoint, the player must first be outside the confines of a town or bandit hideout. Once this is completed, it is still necessary to open up the map, pick a waypoint, close the map, open the item screen, choose the camping option, choose the fast travel option, and then select the ultimate destination. Such a litany of requirements could be attributed to clumsy design, but then why is it that using an item only takes a few button presses? It seems that the game is attempting to instill a sense of deliberation even when it is allowing the player to do something frivolous. You can warp from one side of the world to the other, but you cannot do so instantly. The save system also exhibits this mixture of forced steadiness and automatic convenience. The game auto-saves quite often and contains generous checkpoints within missions, making failure a minor inconvenience. At the same time, should the player want to manually save their game, they must go through the camping process or journey back into town and locate their specific bed. The ability to change outfits or let a few hours slip by is regulated by a system that forces the player to take a break from the immediate action, despite the fact that their progress is simultaneously being saved without any effort on their part. RDR is a game caught between two impulses: The game attempts to simulate the slow moving, sometimes tedious nature of the Mythic West while also offering the benefits of modern, streamlined game design. 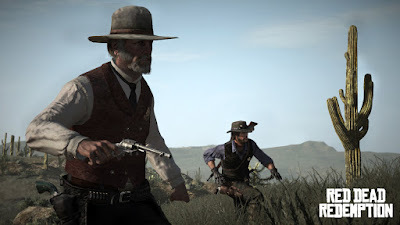 This often makes the game feel capricious: RDR’s layered control scheme, wide open spaces, and moments of forced reflection contrast sharply with its auto-saving, instant items, and fast travel. I admire the attempt to slow the player, even to the point of enforcing moments of boredom, on an intellectual level: it shows commitment to a game design philosophy that employs the medium’s unique ability to tell a story through ludic action (or in this case, in-action). However, I am sympathetic to the realistic constraints that push developers to create accessible games for players with limited time. Ultimately, I suppose I am encountering the same problem that is embedded into Red Dead Redemption’s structure: I like the idea of a slow experience, but had the game completely embraced this philosophy, I might never have had the time to write this. "I like the idea of a slow experience, but had the game completely embraced this philosophy, I might never have had the time to write this." I feel a similar way about a lot of games. I really enjoy the sort of slow-paced tedium that certain games provide. When I played Fallout 3, for instance, I had a rule that I would never use fast travel, and I mostly carried that rule over to RDR. I find that that "slow experience" is most satisfying in games that aren't narratively focused, or games that only have a gentle narrative element. I can lose myself in Mount&Blade or Roller Coaster Tycoon for hours, and as soon as I burn out, I can stop playing without feeling like I've abandoned the game. First, in case you're wavering on whether to continue with RDR, I highly recommend you play to the end. It's probably one of the most unique and thought provoking game endings I've ever seen. Good point regarding the difference between a slow plot-driven game and a slow open-ended game. I also wonder whether RPG elements like leveling up or item collection can affect how slowness is perceived. Even in a game like Fallout, when you aren't pushing the plot forward, you can theoretically still be making "progress" by acquiring new loot and abilities. RDR has very little stat-building which paves the way for times when very little actual progress is being made.